The St George Dragons cemented themselves as one of the world's greatest sporting clubs when they won an unprecedented 11 straight premierships between 1956-1966. They were undefeated in 1959 and won all three grade Grand Finals in 1963. Immortals such as Graeme Langlands, John Raper and Reg Gasnier were just a few of the greats who wore the red and white during these golden years. The Dragons were Grand finalists in 1971 and 1975. before St George and Parramatta played in the historic drawn Grand Final of 1977, the match ending at 9-all after extra time. The young Saints team came out the following week to defeat the Eels 22-0 in the 'Grand Final replay'. Charlie 'Saus' Hazleton was the first Illawarra international in 1937-38 and like many top class players he soon found himself in the Sydney Competition playing for St George (1939 and 1940). 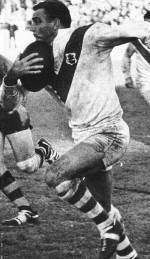 The Wollongong area has produced many great players, including Graeme 'Changa' Langlands, 'Slippery' Steve Morris and Rod Wishart.